Although 15 May, the 70th anniversary of what Palestinians refer to as the 1948 “Nakba”, was initially intended to be the culmination of the protests, the demonstrations are now expected to continue at least until 5 June, which commemorates the “Naksa”, when Israel captured the West Bank and Gaza Strip in 1967. Some 3,000-5,000 people participated today in protests at the five tent camps located some 600 metres from the perimeter fence, the lowest number since the protests began on 30 March. Hundreds of demonstrators marched towards the perimeter fence and threw rocks, flammable materials and other objects at Israeli forces. It was also reported that some protesters removed some of the barbed wired fences set up by Israeli forces approximately 20 meters on the Gaza side of the fence. Israeli forces responded with tear-gas, rubber-coated bullets, and with live ammunition. At least three of those injured were stuck by live ammunition. Demonstrators dispersed in the early evening before the “iftar” meal which breaks the daily fast in Ramadan: it is expected that some protestors may return after Ramadan evening prayers. Since the first protest on 30 March, according to the MoH in Gaza, Israeli forces have killed 104 Palestinians, including 14 children, during the course of the “Great March of Return” demonstrations. In addition, 12 Palestinians have been killed during the same period in other circumstances, including five reportedly shot at the fence or after crossing into Israel, whose bodies are reportedly being withheld by the Israeli authorities. The cumulative number of injuries by Israeli forces is approximately 12,600, of whom 55 per cent have been hospitalized. One Israeli soldier has been injured. The violence reached a peak on 14 May, coinciding with the official transfer of the U.S. Embassy from Tel Aviv to Jerusalem, when Israeli forces killed approximately 60 Palestinians and injured over 2,700 in Gaza, the highest casualty toll in the Gaza Strip in a single day since the 2014 hostilities. The large number of casualties among demonstrators, in particular the high percentage injured by live ammunition, has raised repeated concerns about excessive use of force, alongside calls for independent and transparent investigations of these incidents, including by the UN Secretary-General. 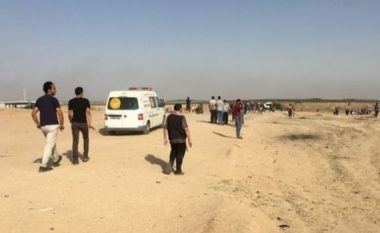 Israel has stated that a large number of fatalities were Hamas members and that an investigation will review the use of force, including incidents of fatal shooting. In the wake of this week’s events, today, the UN Human Rights Council convened a special session on the deteriorating human rights situation in the occupied Palestinian territory (oPt). By 29 to two votes, with 14 abstentions, the Council condemned “the disproportionate and indiscriminate use of force by the Israeli occupying forces against Palestinian civilians” and called for the urgent establishment of an “independent, international commission of inquiry” to investigate the killing of Palestinians during the protests. In the context of the massive rise in Palestinian casualties since 30 March, the humanitarian response in Gaza has been focusing on providing immediate life-saving healthcare, mental health and psycho-social support for affected people, especially children, and monitoring, verifying and documenting possible protection violations. These new needs occur in the context of a pre-existing humanitarian and human rights crisis caused by nearly 11 years of Israeli blockade, alongside the internal Palestinian political divide and a chronic energy crisis that leaves Gaza’s two million inhabitants with power cuts of up to 22 hours per day, on average, and severely disrupts the provision of essential services. The Erez crossing is closed with the exception of urgent cases: according to the MoH in Gaza, four Jordanian trucks entered through the Erez Crossing to transfer medical supplies to the Jordanian Hospital in Gaza. In addition, seven injured people exited through Erez to receive treatment in Jordan. Kerem Shalom, Gaza’s main crossing for the entry and exit of goods, was also closed today. The crossing has partially reopened despite the extensive damage caused by Palestinians on three occasions during the protests. The UN Emergency Fuel Programme has partially resumed after four days of complete halt, with over 150,000 litres of fuel for health and WASH facilities entering Gaza on 16 -17 May through Kerem Shalom. Following the exceptional opening of Rafah Crossing this week for six days, the longest such opening since 2014, the Egyptian authorities announced on 17 May that the crossing will remain open for the whole month of Ramadan. The Egyptian authorities have also allowed the entry of 57 truckloads of goods via Rafah, including three truckloads of medical supplies reportedly donated by the Egyptian Red Crescent.